It's inevitable to find other disciplines in Art or vice versa. Perhaps it'll be easier to see the interconnectedness of information or events if we see them relevant to our daily lives. In aesthetics, mathematics is used to measure the physical attributes of beauty. It was discovered that faces in proportion to the golden ratio was perceived to be more beautiful. In nature, the Fibonacci sequence is observed in the pattern of seeds in sunflowers or the geometry of the nautilus shells. In physics, a mathematical relationship between physical variables (e.g. Force= mass x acceleration) is established to understand our physical world. The theory of soliton waves concerns the coherent pulses of energy in things such as the tidal waves, nerve fibres and superconductors (Jencks, 1997). Solitons were first discovered by a Scottish engineer in 1834 as he was riding horseback along the Union Canal near Edinburgh. They are commonly represented in different forms in the environment. 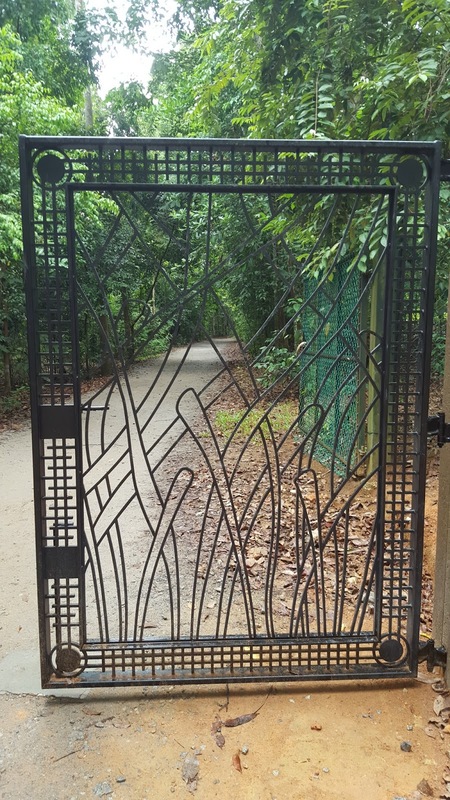 I'll be looking at how solitons are represented in our environment - Metal gates. 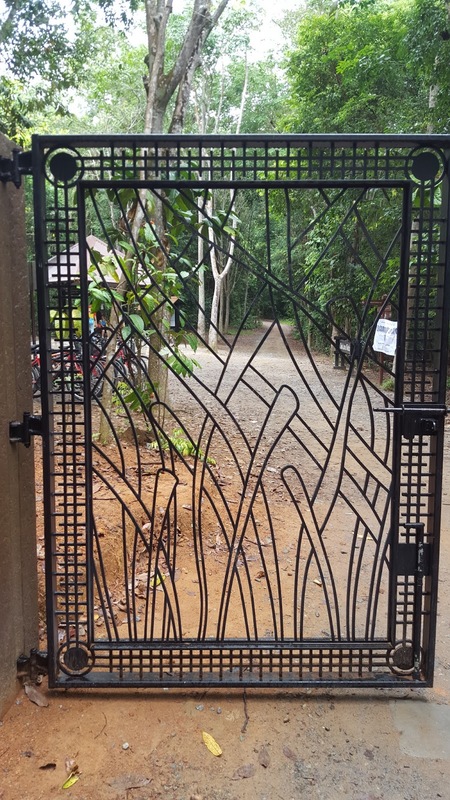 The metal gate in front of Chek Jawa could easily be overlooked when opened. It is visually appealing with apparent figure versus ground. 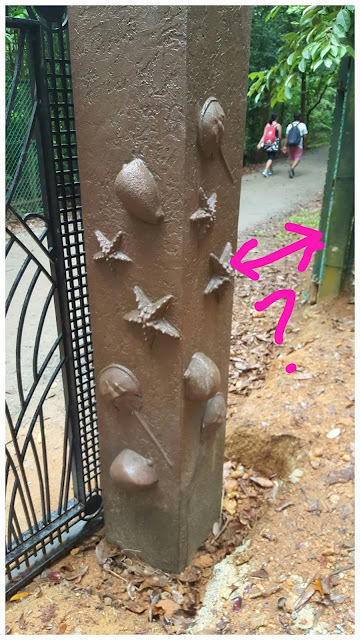 What's puzzling is it sits alone and would not have serve its purpose (besides aesthetics) as a gate even if it's closed (Figure 1). Is first impression from the visitor's perspective a consideration? Unless there's a queue at the gate before opening hours, few people would have noticed this gate. 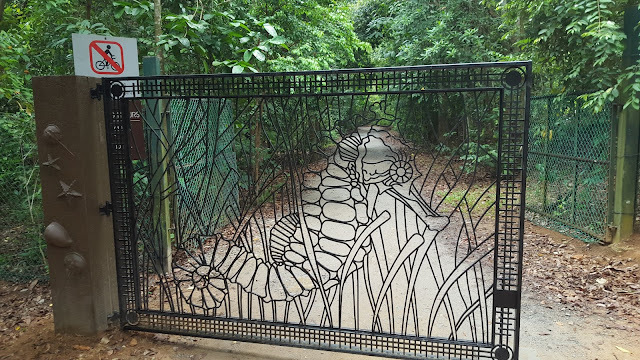 Nevertheless, its design of a solitary seahorse among the seagrass (Figure 5-8) beats the mundane structure of a typical gate in aesthetic sense. 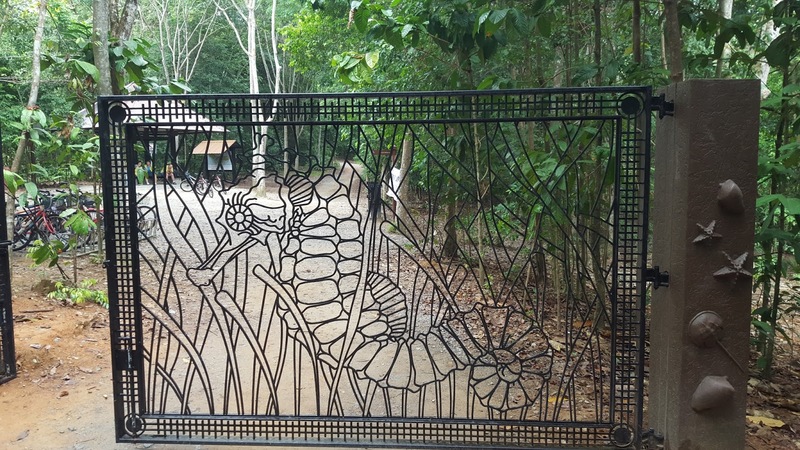 When view from a distance, the gate looks like a colourless stained glass window. The centralised seahorse is tilted at an angle to mimic the movement in the underwater current. It appears that waves of energy are travelling through the curvature of the otherwise straight and stiff metal bars. 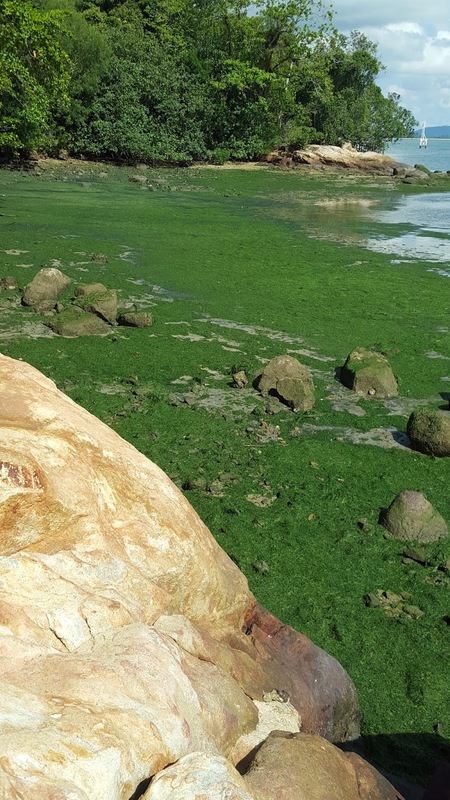 A plant's greatest ally is time. 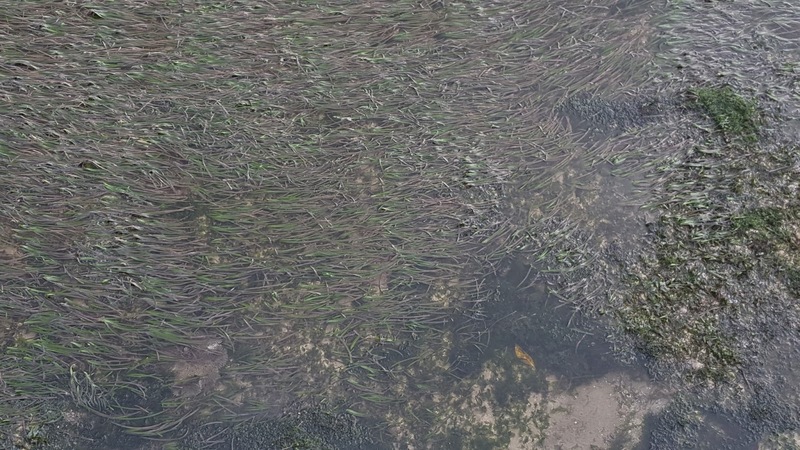 The different height of seagrass shows a constant regeneration. 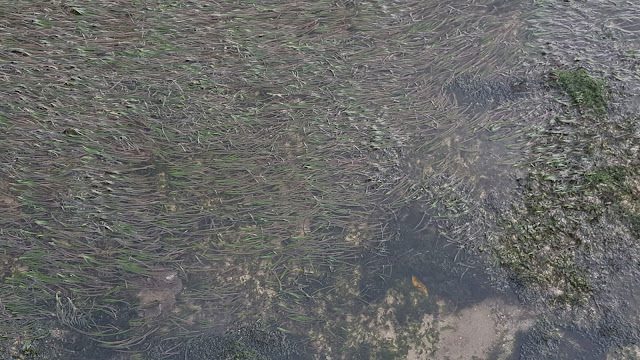 However, as a static image, some parts of the overlapping seagrass are cut off in this image to allow the viewer's eyes to work harder by imaging the full picture. The border of the gates is encapsulated with grids as though subtly telling us that nature is framed and preserved like an artwork. To show one seahorse and some seagrass on the gate is like an understatement to the biodiversity in Chek Jawa. An attempt to depict more richness to the treasured trove is made on the space of the earth-coloured pillar holding the gate (Figure 1). Recognisable creatures such as horseshoe crabs, sea stars and shellfish appear like relief art. 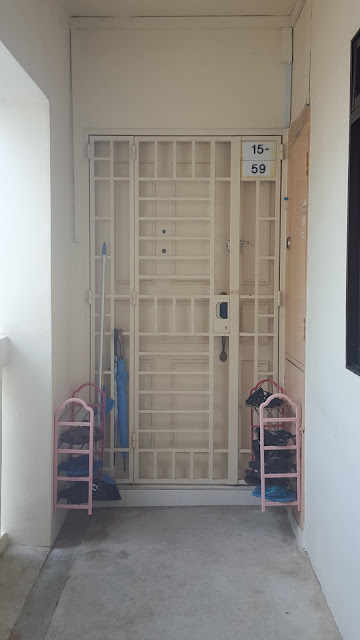 The HDB gates near my neighbourhood (Figure 2-4) undergoes the same scrutiny. The design of the gates are such that the metal bars are arranged in horizontal and/ or vertical manner by default most of the time. 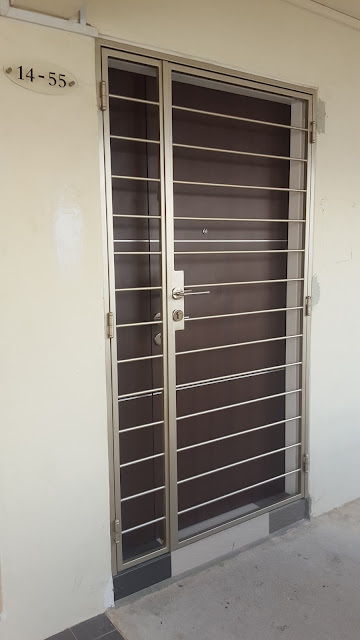 Door gates that are of a different design apart from the default ones are installed by homeowners who bear their own costs. Homeowners most likely would want a gate that reflects their taste or matches the interior besides providing security measures. It's also the first thing that visitors see when they come over for a visit. 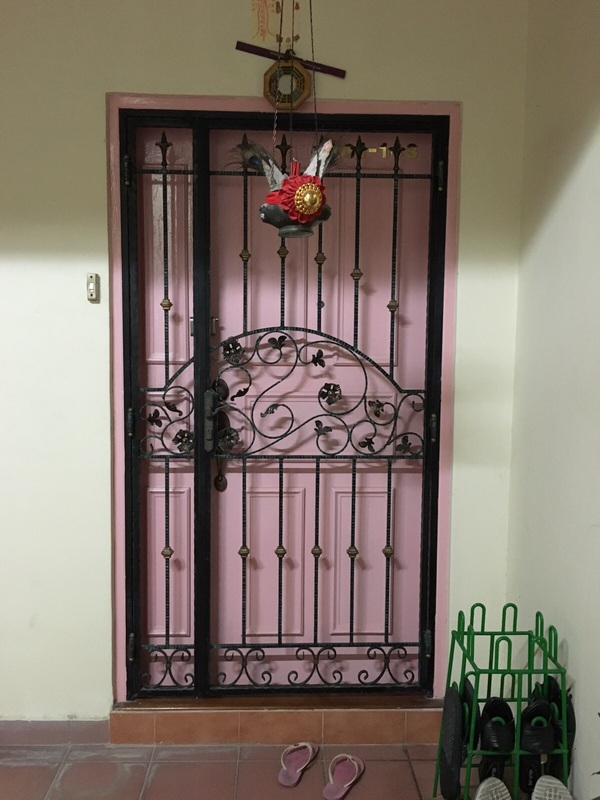 I'm looking at gates most probably because my house's gate looks so boring and I'm stingy to replace it. Jencks, C. 1997. 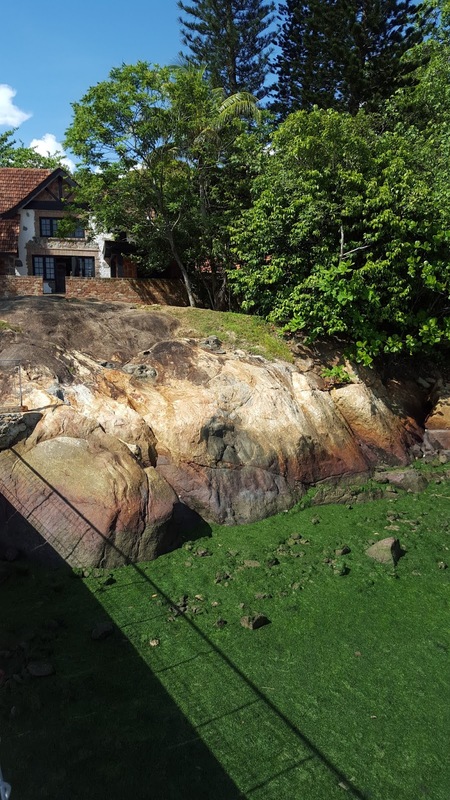 The Universe as measure, In Art and the garden: Travels in the contemporary mindscape. Academy Group Ltd: Italy.